Visible imagery from NASA’s Aqua satellite revealed Typhoon Trami was symmetrical and had a large eye on its approach to Japan’s southern islands. 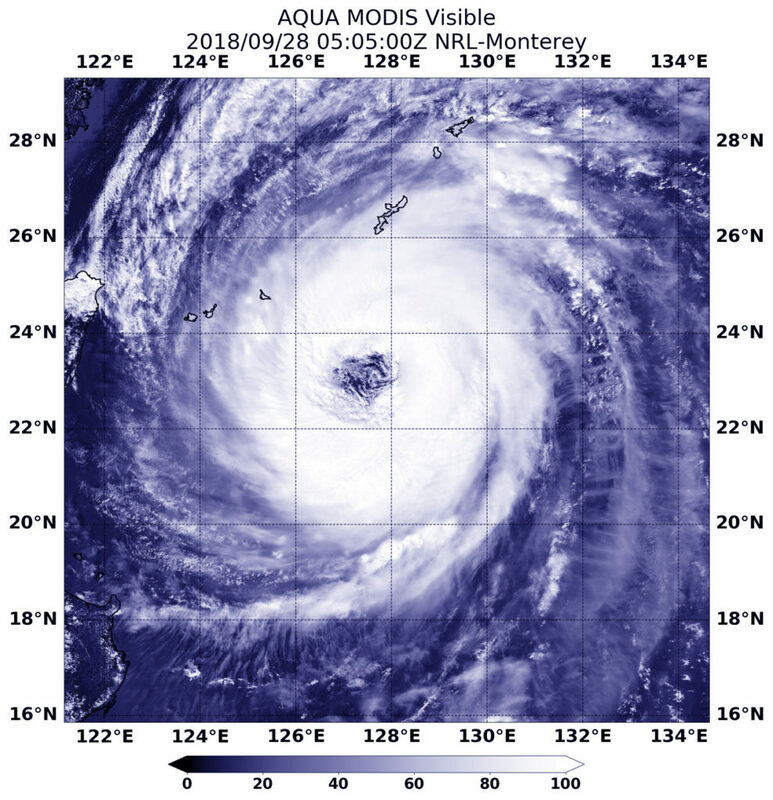 At 1:05 a.m. EDT (0505 UTC) on Sept. 28 the Moderate Resolution Imaging Spectroradiometer or MODIS instrument aboard NASA’s Aqua satellite provided a visible image of Typhoon Trami in the Northwestern Pacific Ocean. The image showed the northwestern edge of Trami beginning to affect the Ryukyu Arc, a chain of Japanese islands that stretch southwest from Kyushu to Taiwan. Infrared satellite imagery shows Trami continues to have a wide eye with convection around the eye beginning to re-intensify. On Sept. 28, the Joint Typhoon Warning Center or JTWC noted that Trami had maximum sustained winds near 90 knots (103.6 mph/166.7 kph). It was centered near 24.2 degrees north latitude and 127.0 degrees east longitude. That’s 168 nautical miles south-southwest of Kadena Air Base, Okinawa, Japan. Trami was moving north-northwest and is forecast to turn to the north-northeast. JTWC has forecast the eye of Trami to pass just to the west of Okinawa Island, Japan and Omami Oshima Island as it moves in a north-northeasterly direction. For warnings and watches from the Japan Meteorological Agency, visit: http://www.jma.go.jp/en/typh/.